Go, Tracy, Go! : Happy 2.5m millennia! Yesterday was the 2,500th anniversary of the Battle of Marathon. We all know what that means - our sport is 2500 years old! 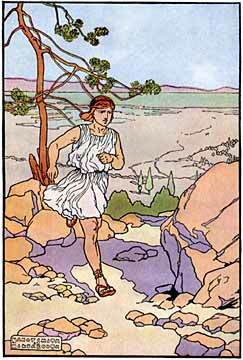 Pheidippides died so that we could all follow in his footsteps... or something. Tomorrow I have a race report from this past weekend, but before that, I wanted to give a shout-out (all '90s style - keeping it real with the "shout-outs") to a friend of mine who recently moved to VA. She was excited to do her first race there, until she discovered that there were literally 20 people registered for the 5k. But, still - good chance to place, right? She was all set to be 2nd overall female, until... the course wasn't marked. And she got lost. I guess the race directors thought that it was a "fun" run, and they took the fun part too literally. Except it's not fun to make a wrong turn during a sparsely attended run and end up running way too far in too long of a time. Weird. Edited: If you check in the comments, you'll see a link to Pheidippides' race report. Thanks, M! This Pheidippides guy should have just died at mile 15. Would have been so much easier! To be fair to him, he had run, you know, 150 miles the two days before. And to be fair to the marathon, it was only about 25 miles until the Queen of England insisted that it be lengthened to run past the family viewing box during the 1908 Olympics. I had *not* seen that! But I added it to the main post - thanks!! Hahahahaha! Stupid Queen of England...let's just all blame her.